Amsterdam, Pieter Mortier, 1689. 8vo. 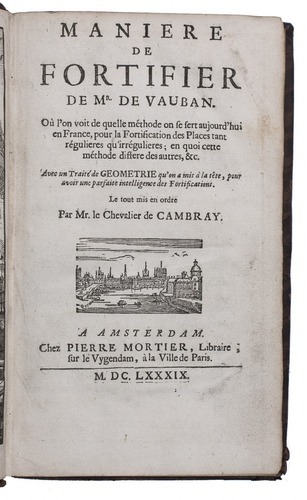 With engraved frontispiece and 30 numbered engraved plates (A-X & 1-8). Contemporary mottled calf, gold-tooled spine. 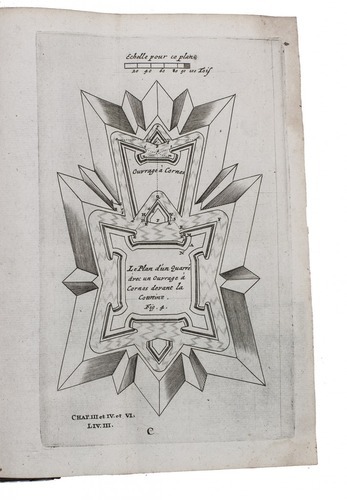 Second edition of a work on fortification by Chevalier de Cambray, first published in 1681 at Paris. 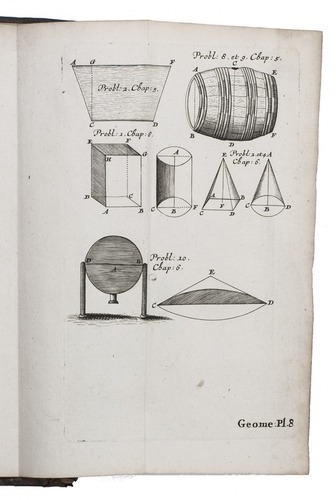 It is divided into two parts, starting with a treatise on geometry. 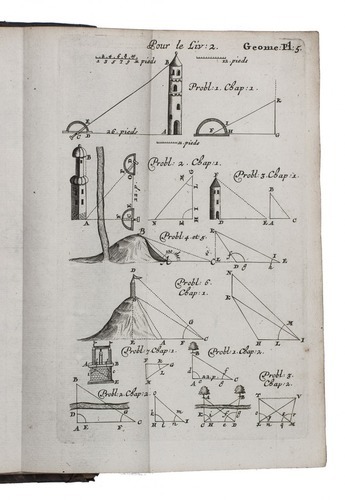 It explains all the different geometric shapes, both two and three dimensional, how to properly draw them, how enlarge the figures once drawn, how to measure height, distance, surface area, etc., clarified in numerous illustrations on 8 engraved plates. 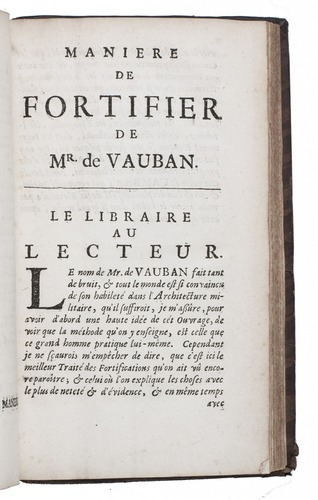 The second part deals with fortifications as described by Sebastien le Prestre, Marquis de Vauban (1633-1707), the most influential military engineer of his age. 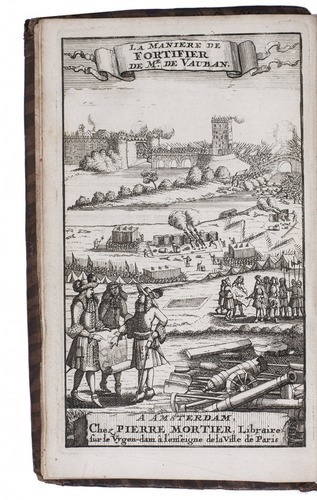 It contains an index on fortification terms and their definitions, and a thorough description of all the different elements, corners and shapes of both regular and irregular fortresses, illustrated with 22 engraved plates. 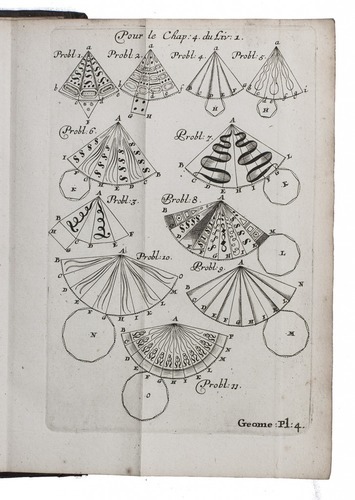 Leaf a1 damaged in the margin, corner torn off plate Q and a small water stain in the lower margin of several plates, none affecting the illustrations. Binding chafed and slightly worn at the head and foot of the hinges, with traces of use along the extremities. Otherwise a good copy. 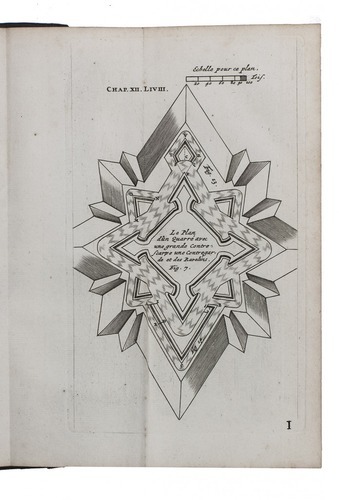 Jähns, p. 1441; Jordan 0575.